The MuxLab CCTV Power-Thru Converter Balun can be used for transmitting video and remote power via a 4-pair CAT5e/6 cable to any CCTV equipment, minimizing the need for multiple cables in CCTV and surveillance installations. You can use a central 24VAC CCTV power supply to remotely power a 12VDC camera, thanks to its ability to convert 24VAC to 12VDC. 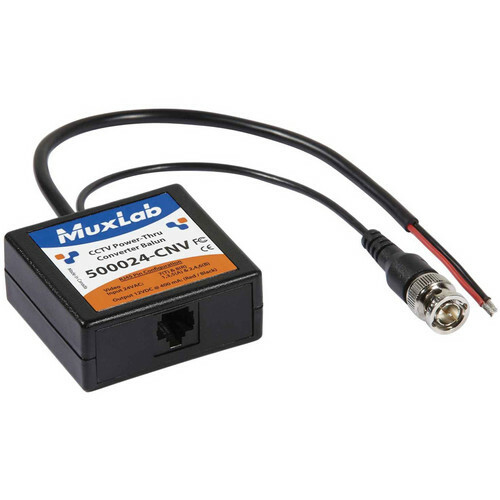 For a complete cabling solution, this balun can be used in conjunction with MuxLab’s CCTV Power-Thru Balun (500024), Passive CCTV Power Integrator Hub (500136), or Passive CCTV Hub (500130). In this configuration, the balun is installed at the camera side. Shorter distances may result with certain DVR models. Color: Certain models of DVR may yield shorter distances of 1,000 to 1,500' (304.8 to 457.2 m). Class II power supply recommended. With a maximum consumption of 400 mA. Box Dimensions (LxWxH) 5.4 x 4.4 x 0.9"